It's always a tricky question and one I see being posed more and more, year after year. How many of your Childrens presents should be from Santa, and how many from Parents? To be very honest, I truly don't think it matters and personally I randomly write love Santa on some and love Mummy and Daddy on others to the boys, they're not old enough to read yet, but when they are I'll still continue with that. 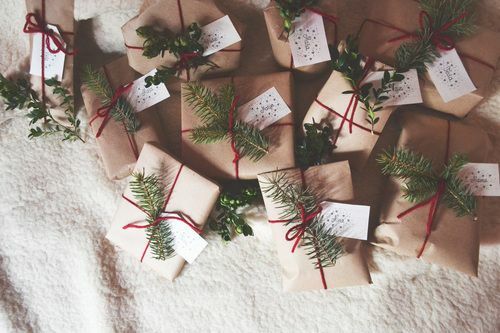 From my own childhood, I vividly remember always having some presents under the tree in the build up to Christmas, and then the over Christmas Eve my parents would put another portion under from 'Santa', it worked well and definitely made it magical. I don't ever recall thinking Oh Santa got me more than Mummy and Daddy, and I really can't imagine many other children would be thinking that either. For as long as children believe in Santa and understand that he brings presents to boys and girls who are good, I feel it's important to give them at least a few presents from the big guy. If that's stocking presents, one big present, or half of their stash, I don't think that's relevant, just as long as they receive something to stop them thinking they're on the naughty list. I even write presents to John from Santa, so that the boys don't think he's had a naughty year, and again will continue to do so as they grow up. Christmas is more about magic for me, and it certainly is about magic for my boys, I can't ever see a day when they will be counting presents on Christmas morning wondering which are from Santa and which are from us. So I'm not sure who's actually faced this, to invent the whole question itself. I'm pretty certain my children will be just far more wrapped up in all of the Santa footprints I intend them to find on the hallway, the stockings on their doors and the fact Rudolph has been in and nibbled on the carrot they've left. Totally agree. It's definitely about the magic of Christmas. This year we're staying fairly low key but next he will have his stocking and a present from santa. He'll have a Christmas sack from mumma and daddy, as well as his Christmas eve box! I'm so excited!! !